Diane Amundson might as well be synonymous with volunteer. The self-employed leadership and strategic team builder has been volunteering so much in her last 26 years of living in the Winona area, she said there are plenty of times she is asked to lend the community a hand. As the July Volunteer of the Month, it would be easier to list groups Amundson has not helped. 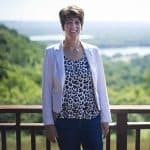 She has served on boards and committees for the Winona Community Foundation, Home and Community Options, Bluffview Montessori School, the Winona Rotary Club, the National Speakers Association Minnesota and the United Way of Winona. Of these groups, she has served as the president or chair of the Winona Rotary Club and at the Bluffview Montessori School Board. Outside of serving on the boards, Amundson has also presented to and served for groups at all three colleges in Winona, the Sequoia Club, Women in Business and the Winona Area Society for Human Resource Management.